Let you bird take a stroll down to the sea shore and and enjoy a fun chew along the way. Your feathered friend will love this bird foot toy which contains 4 Jumbo Popsicle Sticks and 2 Puffy Sea Life Creatures to chew and enjoy. 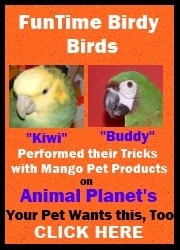 Ideal for Cockatiels, Conures, Senegals, Quaker Parrots, Caiques, Amazon Parrots, African Grey Parrots, Eclectus Parrots, Pionus and all similar sized birds.